A.P. 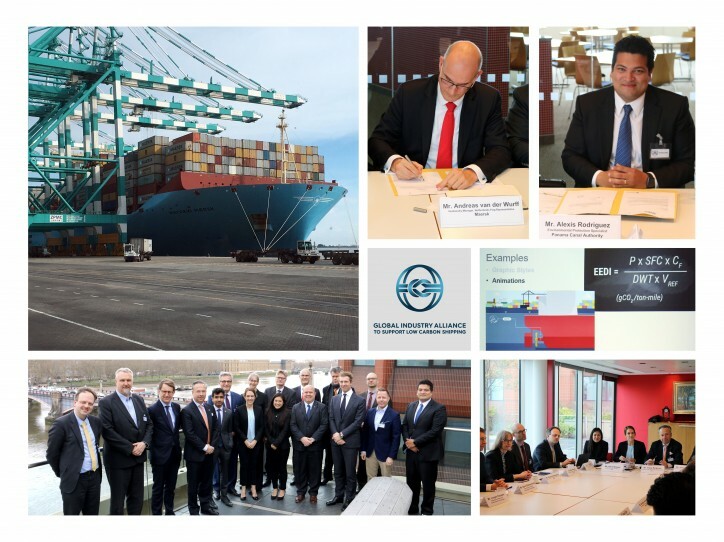 Moller – Maersk A/S and the Panama Canal Authority are the latest entities to join the Global Industry Alliance to Support Low Carbon Shipping (GIA). The GIA now has 18 members, including leading shipowners and operators, classification societies, engine and technology builders and suppliers, big data providers, oil companies and ports. The new members signed up to the GIA during the fifth meeting of the GIA Taskforce at IMO Headquarters in London, United Kingdom (15 March). The GIA Taskforce meeting (photos) progressed work on several on-going projects, including on the validation of performance of Energy Efficiency Technologies, the assessment of barriers to the uptake of Just-in-Time Operation of ships and resulting emission saving opportunities from its effective implementation, as well as work on the current status and application of alternative fuels in the maritime sector and barriers to their uptake. The Taskforce was also shown a preview of an open access E-Learning course on the Energy Efficient Operation of Ships, which is expected to be completed and launched later this year. The Taskforce also formalized the extension of the GIA until 31 December 2019 and agreed to develop a White Paper outlining a vision and potential priority areas for the GIA.